Please join Buzz in welcoming Mike Terlesky to the Houston Engineering Team. Mike is originally from the Norfolk Virginia area, joined the Navy for a five year enlistment than attended Old Dominion University where he earned his BS in Mechanical Engineering and remained in Virginia working at Standard calibration Inc. Mike spent the last few years there working as a Controls Engineer designing, installing and troubleshooting controls panels for Commercial, Industrial and Military Facilities. In his spare time, Mike enjoys surfing, fishing, golf and hiking. 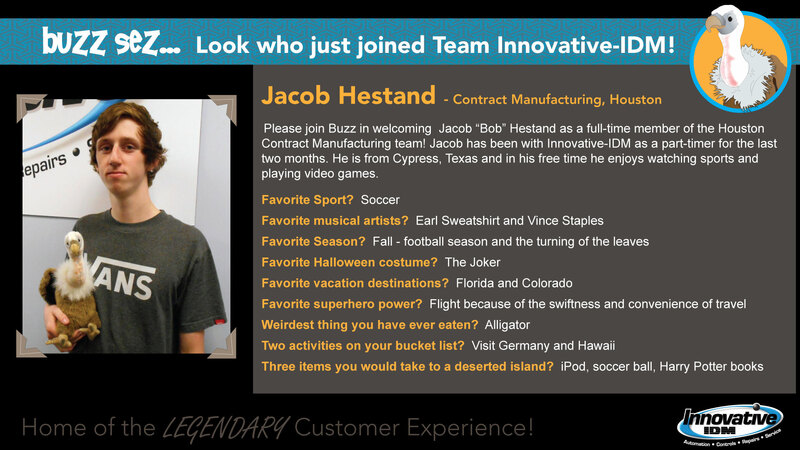 Please join Buzz in welcoming Jacob “Bob” Hestand as a full-time member of the Houston Contract Manufacturing team! Jacob has been with Innovative-IDM as a part-timer for the last two months. He is from Cypress, Texas and in his free time he enjoys watching sports and playing video games. Step right up with your best bubble blower and earn your team 50 points! That’s what Anna did with her award winning BOB (big ol’ bubble). The competition was tight, but no one was able to beat her one, single, giant, bubble. There are many ways we have fun at work, but today we did it with bubbles. Congratulations team Bezibees, you guys are 50 points closer to possibly winning a half day off! – Britt W.
Do you need Electrical Control Panels, 508A, Kitting, Pneumatic Assemblies, Aluminum Extrusion work stations and assemblies? Have you run out of time and/or expertise and need help? Innovative-IDM contract manufacturing is a UL508A control panel shop among many other things. Adam Ring tells the story. 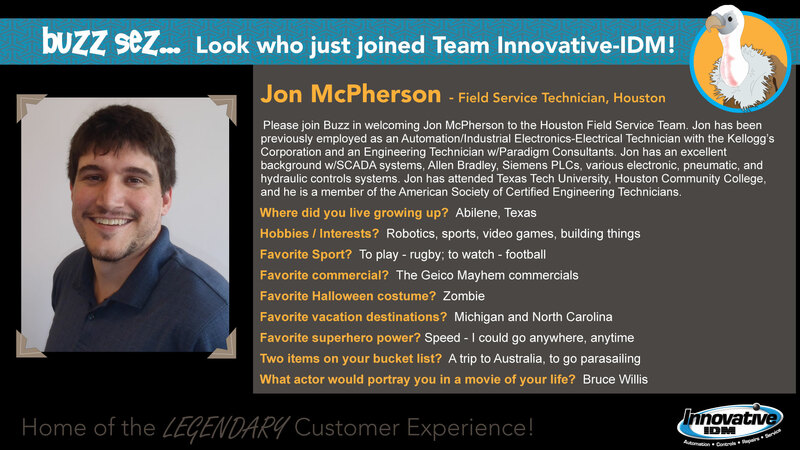 Please join Buzz in welcoming Jon McPherson to the Innovative-IDM Houston Field Service Team! Jon has been previously employed as an Automation/Industrial Electronics-Electrical Technician with the Kellogg’s Corporation and an Engineering Technician w/Paradigm Consultants. He has an excellent background w/SCADA systems, Allen Bradley, Siemens PLCs, various electronic, pneumatic, and hydraulic controls systems. Jon has attended Texas Tech University, Houston Community College, and he is a member of the American Society of Certified Engineering Technicians. If you are an engineer or maintenance professional in an industrial manufacturing setting, Innovative-IDM has an entire facility of services and products that can help you, including 24-hour field service technicians. We have a presence in Houston, DFW, Austin, San Antonio, Tulsa, OKC, Little Rock, Memphis, Baton Rouge, Mobile and other areas. Here is a quick tour of our DFW location. If you’d like further information about our services, please go tohttp://InnovativeIDM.com and click on the knowledge center.